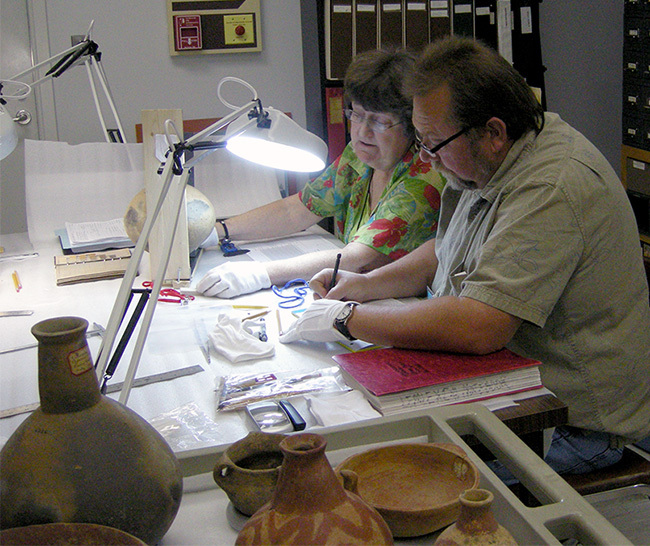 Robert Cast (Caddo Nation THPO) and Dr. Ann Early (Arkansas State Archeologist) documenting Arkansas pottery collections at the Gilcrease Museum in Tulsa. Over the last century, many people and institutions explored archeological sites in Arkansas and took home collections and records of their discoveries. In the decades before Arkansas had its first professional resident archeologist, many enthusiastic amateur Arkansans amassed personal collections and kept careful documentation of their finds. These records and collections had the potential to contribute significant information about the state’s history and prehistory. Reclaiming that information, and where possible the collections, was a high priority for the Survey as soon as it was established. Data about the location, age, and cultural identity of sites and their contents are integrated with the Survey’s site database and provide vital information that cannot be duplicated today because thousands of these discovery locations have been irreparably changed or destroyed by agriculture, vandalism and development. Records and collections can be valuable if they come from a single location, or if they represent decades of collection. In the last 50 years hundreds of collections have been donated to the Survey and dozens have been repatriated from out of state institutions. Here are a few of the many notable contributions. Throughout the first half of the twentieth century, Mynne Slagle Harris collected artifacts on her family farm in Washington County. After her death in 1962, the 620 artifacts went to her nephew, Tom Harris in New Mexico who graciously donated them to the Survey in 2013. Such a large collection from a single site is a rarity and of particular scholarly value. 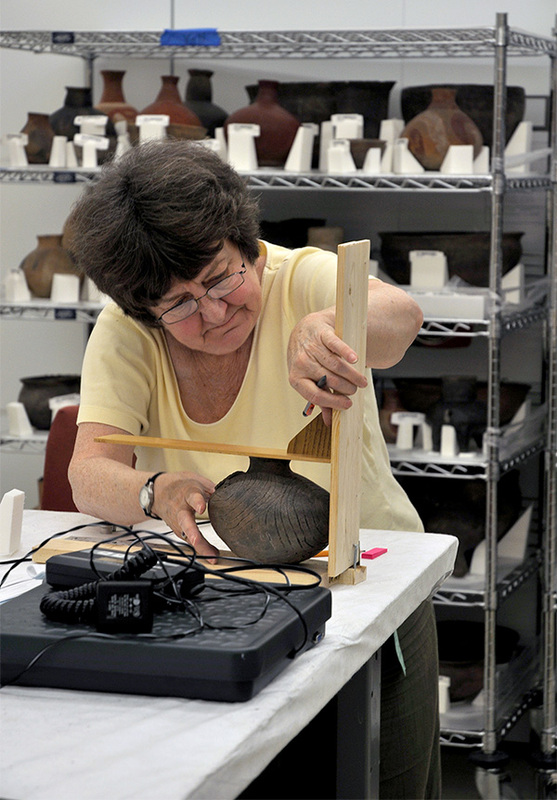 Dr. Ann Early (Arkansas State Archeologist) documenting Arkansas pottery collections at the National Museum of the American Indian collection facility in Suitland, MD. 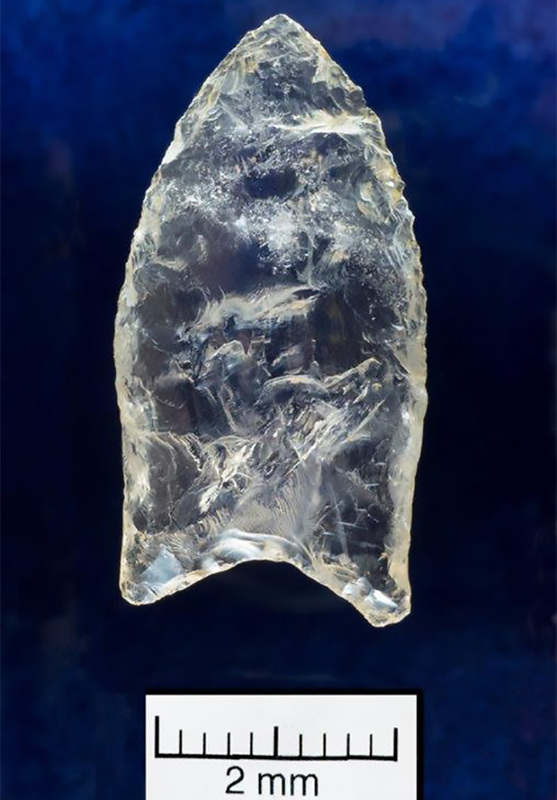 Quartz Clovis point from the Sargent Collection. Volunteers Leanda Gavin and Steve Longacre assist in processing the Sargent Collection. In 1917, Mark R. Harrington was sent to Arkansas by New York collector George Heye to make collections at prehistoric Caddo sites in southwest Arkansas. Harrington published a description of his expedition but his artifacts went back to New York. In 1973, former Survey Archeologist Cynthia Weber photographed the pottery from Harrington’s work and the images became part of the Survey’s photo archive. In 1939, Philip Phillips, then a Harvard graduate student, explored the Ouachita River valley between Arkadelphia and Mt Ida, making artifact collections and keeping a detailed diary. His collections remain at Harvard, but his diary helped Survey archeologists to locate dozens of archeological sites that Phillips found significant. Many of these sites were also visited decades earlier by Mark Harrington. In the 1950s and early 1960s, Curtis Horner collected artifacts from sites in the White River area of north Arkansas, many in the location soon to be flooded by Beaver Lake. Between 1994 and 1996, the Hornor family donated a collection of these artifacts to the Archeological Survey. Over the same period, Quinby Smith, another North Arkansas resident and Archeological Society member, made a similar collection in the Baxter County area and his collection too was donated to the Survey. The Horner collection is particularly noteworthy since most of the sites he visited are now under water. In 1962 and 1963, the American Museum of Natural History sponsored an extensive archeological survey of the central Mississippi River valley, including much of eastern Arkansas. The Ford-Redfield Survey as it was called visited over 250 sites in Arkansas, and made collections at many. In 1974, artifacts from the project were incorporated into the Survey’s holdings along with documents describing the sites. Hafted bifaces from the Figley Collection. In the early 20th century, thousands of highly decorated pottery vessels and other artifacts were discovered in the Arkansas River valley near Dardanelle, and within a few years they had gone to individuals and museums around the world. The collections were never studied, but they represented a spectacular and enigmatic remembrance of large Native villages that once existed along the Arkansas river on the eve of French and Spanish colonial appearance. 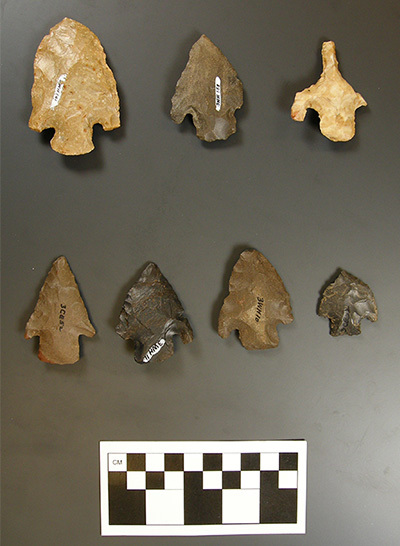 In 2009, Dr. George Sabo and his research team undertook a project to study the place where these discoveries were made and to examine the artifacts themselves. 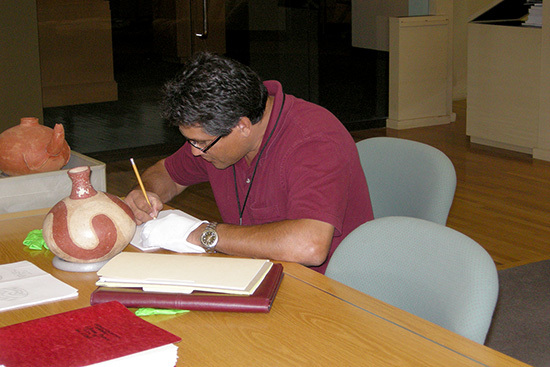 Supported by a $240,000 grant from the National Endowment from the humanities, documentation teams of Survey researchers and their Osage and Caddo tribal partners went to the National Museum of the American Indian in Washington, DC, and to the Gilcrease Museum in Tulsa, Ok, where two of the largest collections resided. There they analyzed and photographed nearly 800 vessels and other objects and brought the data back to Arkansas where it is permanently archived. For many decades in the early 20th century, Harry Lemley of Hope collected prehistoric artifacts from all over Arkansas and kept meticulous journals of their source. In 1954 he sold the collection to Thomas Gilcrease of Tulsa and it resides today in the Gilcrease Museum. Shortly after the Survey’s inception, Dan Printup, the Survey photographer was allowed to photograph all of the approximately 2500 pottery vessels and to copy Lemley’s journals. The images and records, from over 100 archeological sites, have been integrated into the Survey’s site archives and research files. In 2005, the Survey received an important bequest of 1228 artifacts from the late Charles Figley of Judsonia, who had passed away the year before. This carefully cataloged collection came from sites in White County that Figley and his wife Katherine had been reporting to the University Museum and the Archeological Survey since the early 1960s. In all, the Figleys reported 285 sites in the little-studied White and Little Red River valleys, and the collection complements and increases the value of their lifelong contributions. An in-depth review of the collection has subsequently been published in the Arkansas Archeological Society Bulletin (Volume 54 for 2015) by Jerry Hilliard. 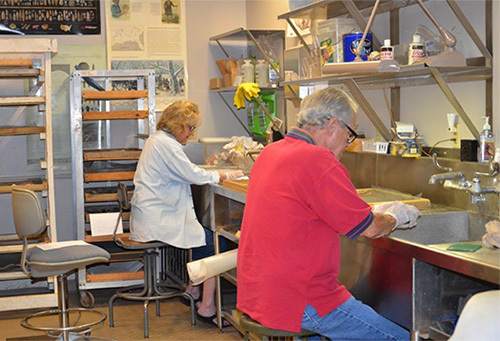 Society members Barbara and Ron Toothaker cleaning lithics from the Sargent Collection. Forrest Sargent of Hot Springs collected artifacts from the surface of over 50 sites in the Hot Springs area over a 30 year period. When the Survey began in the late 1960s, he shared his discoveries and site locations with the newly installed Station Archeologists, Frank Schambach and James A. Scholtz. 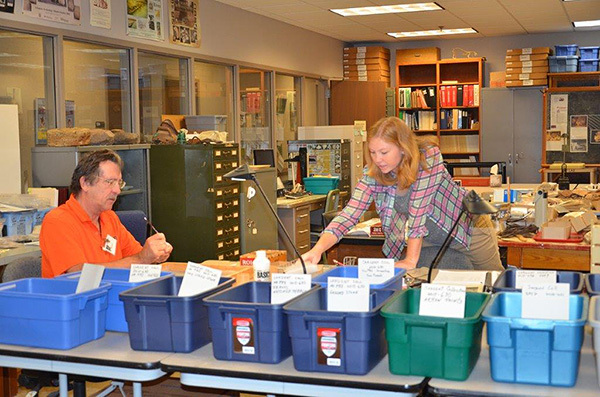 In 2013, his son, Al Sargent and family donated a collection of over 50,000 artifacts from nearly 50 different archeological sites to the Survey. They constitute an irreplaceable document of sites that are largely unavailable for future study. In 2012, the Charles H Nash Museum at Chucalissa Archaeological Site, both part of the University of Memphis, asked the Survey if they could repatriate all of their Arkansas collections, and the Survey eagerly accepted. These included more than 64,000 individual objects from foot surveys and donations made by their staff since the 1970s, and a very large collection that included thousands of artifacts, soil samples, and excavation records, from the University’s Archeological Field School that took place over several years at a Mississippian era town site west of Memphis. After two years spent organizing the collections, they are part of the Survey’s curation and records holdings. Thanks to the generosity of these and many more individuals and institutions, and their concern for the historic and research value of Arkansas artifacts in their possession, irreplaceable information from sites, exhibits, and archives has come back to the state to be of value for generations to come. 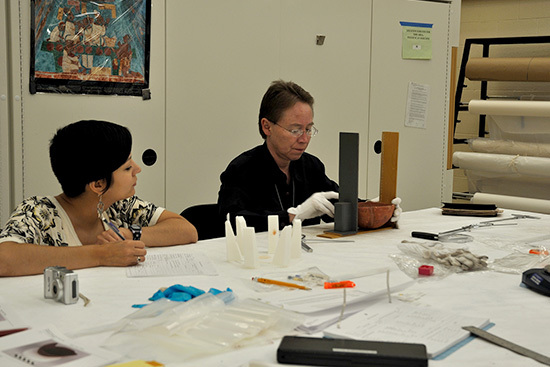 June Carpenter (Osage Nation Historic Preservation Program) and Dr. Andrea Hunter (Osage Nation THPO) documenting Arkansas pottery collections at the National Museum of the American Indian collection facility in Suitland, MD. Bobby Gonzales (Caddo Nation NAGPRA Coordinator) documenting Arkansas pottery collections at the Gilcrease Museum in Tulsa.